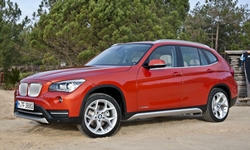 2013 BMW X1 Pros and Cons | Page 1 of 1 | Why Not This Car? What drives people to buy (or not buy) a certain car? TrueDelta's members share 2013 BMW X1 pros and cons based on their real-world driving experiences. Hear "Range Rover" and what do you picture? Perhaps a large, rugged SUV in the wilds of Africa. Oh, wait, that's the Land Rover. A Range Rover? That's also a large SUV, but much more stylish, luxuriously furnished, and most prevalent in the wilds of Beverly Hills and Greenwich.